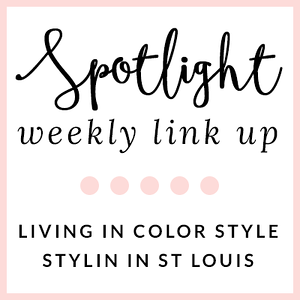 Stylin in St. Louis: Spotlight of the Week: Graphic Tops…. Spotlight of the Week: Graphic Tops…. Happy first day of Spring! Today our spotlight of the week is graphic tops! Graphic tops are always so much fun! I found this peony top at J.Crew Factory and I could not pass it up! It is so much fun for spring! I kept it pretty casual with this look and paired this look with a blazer and denim. Come share your favorite graphic print looks with Elle and I! Be sure to enter the Stella and Dot On the Mark Necklace giveaway HERE! 1. 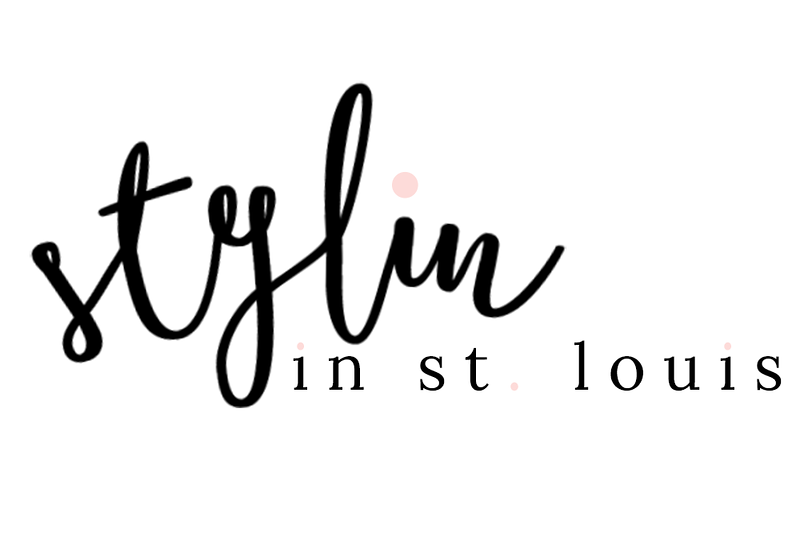 We kindly ask that you follow the two hosts: Elle from Living in Color Style and Jacqueline from Stylin' In St. Louis via Bloglovin or GFC, and of course, our co-host, Morgan of Eeny.Meeny.Miny.MOrgan. blog. Spotlight: Our spotlight this week is Alice from Happiness At Mid Life! Alice's pink look is just perfect with the pop aqua! A pink blazer is such a great staple item for spring! Go check out her blog! Nextweek: Next week or spotlight weekly theme is button-ups! Thanks for linking up! See you next week! Eee! That's the PERFECT blazer! Wish I could shop right now!! Great link up! Love this look! That blazer is so cool! So happy to have found your fab linkup. I'm so in love with the total look....it's so Spring & chic!! Yep everything about this outfit is fab! And now you're making me wish I had gotten that color Beau also! It's beautiful! Thanks for hosting, lady! Perfect spring-y piped blazer, babe! :) Happy Thursday! Great spring outfit! I am so in love with that blazer...so tempting. 3 beautiful ideas at you girls nailed. I love graphic t shirts. I don't own any graphic t-shirts! I have never really been into them.. does a striped shirt count!? haha. And can we talk about how cute your bag is!? love it!! such great looks! actually just met morgan the other day at kcfw, she is so darling! 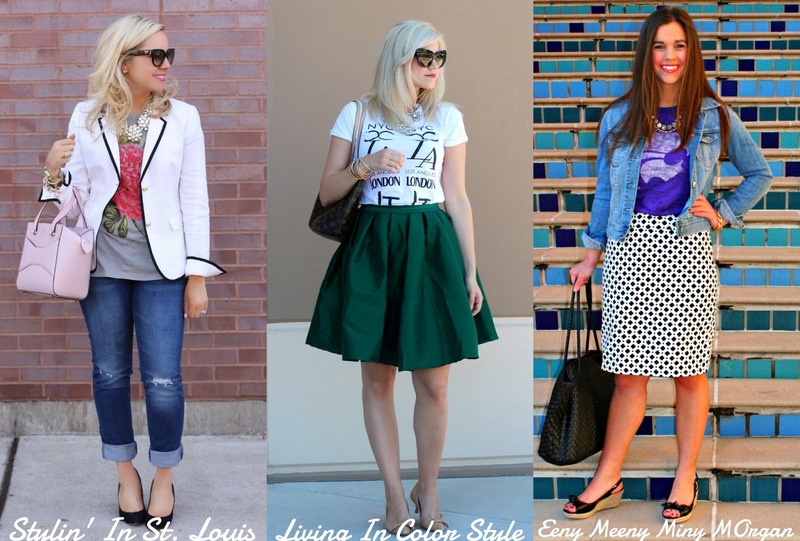 I love the graphic tee as it can be styled in so many different ways. Your spring look for today is spot on with the flowers! I am in love with this look--every item is so pretty! 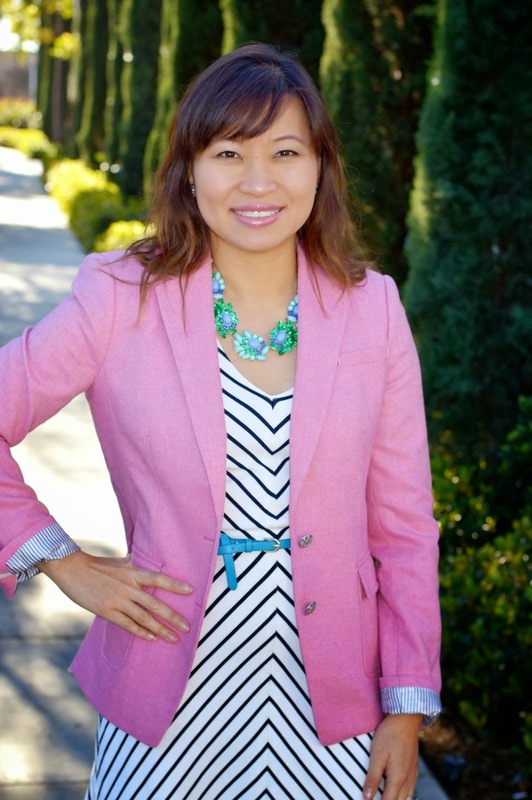 From the girly shirt to the sparkly necklace to the crisp blazer--gorgeous! I am loving your hair lately, GORGEOUS! and that Kate Spade bag is to die for! Also, I love that our poses are like the same in this collage! Haha. Looking beautiful once again in a chic jeans ensemble. I love that Pink Peony Tee, so girly & cute. The blazer with the piping, the necklace & purse are quite gorgeous too. I agree about Alice's Outfit too. She always looks great and a Bright Pink Blazer is a Must for Spring!! Loving that blazer with that tee - so cute lady! I love the casual/classic combo! I should get a few graphic tees. Mine are all solids or stripes right now. Love everything about this look. Amazing styling. Dang that graphic tee is adorable! And I love that you paired it with a blazer! It is the perfect way to dress down a blazer! Love it! everything of this outfit is fabulous.